If you’re looking for a useful long-term travel packing list, then sorry but I’m afraid this post won’t be much help. I’m awful at packing light, always have been and after 10 years of trying to refine my technique I probably always will be. Packing is by far my least favourite part of travelling, I’d even go so far as to say I hate it. Therefore I’m not going to try to give advice on something I’m rubbish at, instead here’s a different angle on this subject. This isn’t the perfect packing list, instead, it’s the dilemmas I faced packing to leave the UK to travel, live and work abroad. I hope it’s something those terrible packers amongst you can relate to. 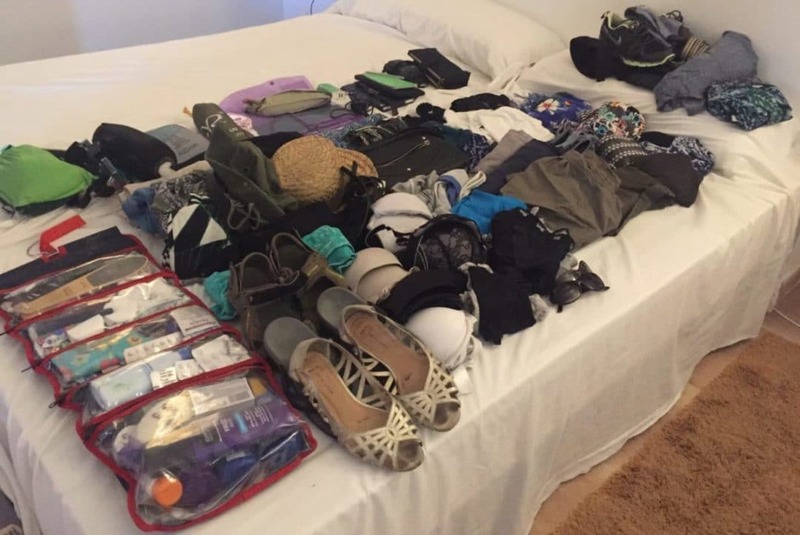 When planning for our big adventure one of the most difficult things for me was deciding what to pack. On my previous long-term trip of 15 months, 10 years before this one, I massively overpacked and was forced to dump a quarter of my belongings about a month into the trip. My backpack was so heavy I literally couldn’t put it on without help. Walking further than a few steps was near on impossible; it proved a traumatic experience for any travelling companions – namely my sister! Subsequent two and three-week trips weren’t much better. I always try to pack light, am not overly bothered about my appearance, and never carry a hair dryer and straightener. However, for some unfathomable reason, my bag always ends up as big as me or if it’s a smaller one it almost bursts at the seams. I just don’t know why! So for this trip, I was determined to pack light and began researching long-term travel packing listsmonths before we were due to leave. Most were pretty good, sound advice, but they were all different and I found myself thinking ‘but what about this?’ and ‘what about that?’. The fact that we weren’t only travelling but would also be living and working abroad meant we had more eventualities to be prepared for. So armed with many ideas from multiple sources I made my first packing attempt about three weeks before we left. Most of our belongings had already been sold and we’d thinned our wardrobes right down. I was expecting it to be easy task…how wrong I was! 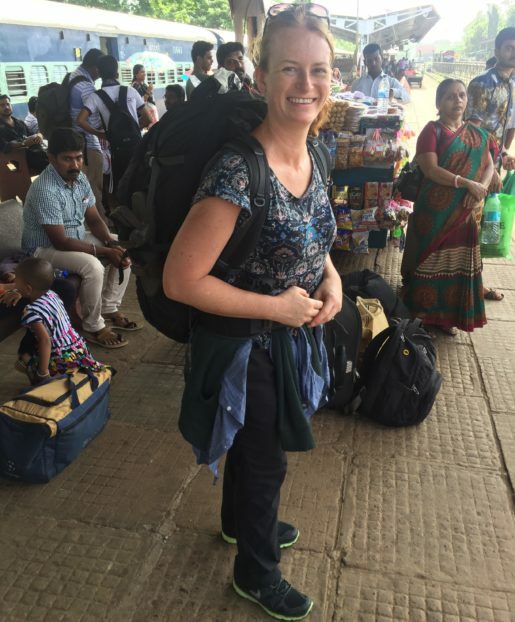 As you may have already read in Travel Long-term or Not | The Big Decision, that first packing attempt for this trip was dismal – heavy and large! In my defence I did have a weeks ‘holiday – holiday’ (not travelling) with my family in Mallorca before we left Europe. This meant I took several things which I intended to send home with my Mum and sisters when they came back to the UK. I unpacked and repacked what felt like twenty times over the following few weeks. Several tantrums were thrown in for good measure much to Andy’s amusement. Typically, and just to rub salt in the wound, he’s great at packing. Three pairs of pants, three pairs of socks, two pairs of shorts, a couple of T-Shirts and a pair of jeans…DONE! Plus a first aid kit and survival kit of course (he likes to be prepared)! Ten minutes before bed the night before departure, I took out a tin mug from my main bag. That gave me just enough room to squeeze in a nice bottle of red wine a friend had given me (got to get your priorities right after all), an extra maxi dress, and a denim skirt. By then I’d managed to lose about a third of the original pile and was confident my hold and cabin luggage were within the weight restrictions. Ignoring Andy’s comments that I looked like a tortoise and that he found it painful to watch me lugging the bags around, I was reasonably happy with my final packing attempt! My happiness was short lived. When we arrived at London, Heathrow Airport, I was over the weight limit and had to unpack in the middle of departures. Out came two maxi dresses, a denim skirt, and worst of all, the bottle of wine my friend had given me – gutted! In addition to my packing dilemmas and mainly for the preservation of information, I’ll now share the list of what remained in my bags when I left Mallorca to fly to Mumbai, India, the first stop on our adventure. Here are some other great travel backpack ideas from The Family Voyage. This list was definitely a marked improvement on what I started with, but I soon realised when we arrived in India and had to move around that I still had way too much. In fact reading that list back now it’s actually quite embarrassing. If I’d have known I could manage without these at the beginning I would have left them behind. Luckily I only added three items to my bags whilst we were travelling. The first was a polo-shirt in Mumbai, India. I only had one T-shirt that covered my shoulders and having your shoulders exposed in many places in India is a no-no! The second was a pretty green silk scarf my mum-in-law bought me for my birthday. The third was a tube of aloe vera gel, much needed after I got very sunburnt on Inle Lake in Myanmar. I also bought some face creams, mascara, face powder and concealer from duty-free in Bangkok whilst waiting for our flight to Siem Reap. These were just replacements though so no extra weight there. I’ll refer back to this long-term travel packing list ready for our next destination to see if I’ve been able to reduce it. Hopefully, I’ll be travelling much lighter. Is anyone else out there incapable of packing light? If so do you have any packing dilemmas or horror stories to share? What a nice post! Thank you for letting us know. Backpacking is a great way of life, just like any lifestyle, it has ups and downs. I like to travel, but the problem I am facing is carrying a bag. So true, it’s my biggest problem. We’re due to hit the road again in 3 months – this time I’m determined to pack light! I feel your pain! I’ve never had to pack for long term travel, but I have tried to be one of those “2 weeks in a carry on” people and it has never worked well! I know nightmare isn’t it! I’m going to report back in Jan 2018 after I pack for Latin America! I love packing, but I’ve never traveled for longer than a month or two at a time, so I guess I’ve got no room to talk! It always feels like a fun puzzle to me, and it’s interesting to look inward and learn about what kind of things you prioritize. Thanks for sharing! Woo! This was a quite extensive travel packing list and I am still wondering how did you manage to backpack that much stuff. I really pack light and prefer to buy there itself when on long trips. I totally feel this! I’m about to embark on a year-long trip and I’m starting the ‘what-the-heck-do-I-pack’ freak out! Haha! My vain side makes me want to take enough of my favorite mascara for a year! Haha! What a detailed list. I agree with everything. I can remember begging for hair band when I had surplus back home. Haha yes – despite taking all that I’m still getting friends to bring me back things like toiletries and underwear when they visit or other things that have been lost or broken! Haha I am the complete opposite when I go travelling! I take a little amount of clothes and then our filming gear. On our trip to South East Asia we are planning on going as light as we possibly can! However saying that, packing is still hard on what to take and what not to haha! Light is definitely the way to go for sure, I have no filming gear but next time I’ll be travelling with a laptop for work so I will 100% have to cut back on everything else! Packing can be so hard sometimes! 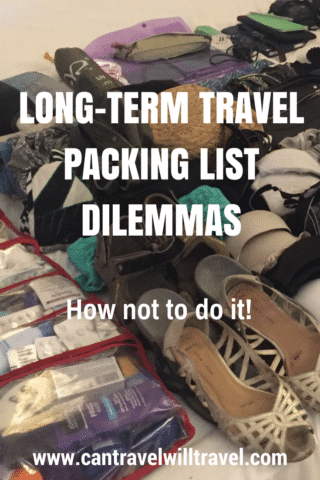 I always find that I pack less for longer trips than shorter ones–I’m not sure why, lol! 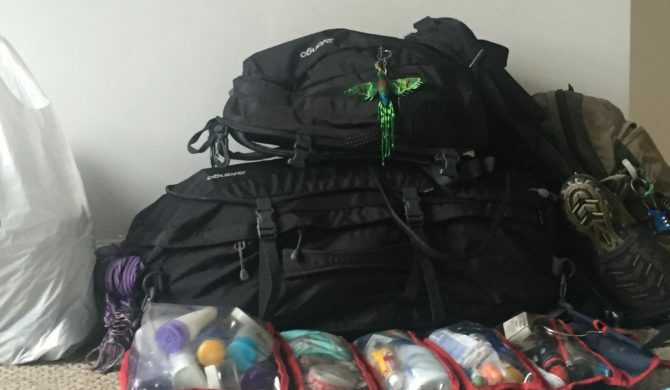 Thanks for sharing what you pack–always nice to see what others bring with when they travel! Yes definitely, I’m really embarrassed looking back on that huge list now…but it’s a good basis for cutting down next time! Whoa, when you lay it all out there like that in a big list it looks like so much stuff – amazing that you can fit in all into two relatively small bags. Great list, thanks for sharing. I’m always curious to see what other people have in their packs. It was a silly amount….never again – haha! YES!!! This is so me!!! I cannot pack light so I appreciated your more in depth packing list! It’s more to my liking than simple and tiny ones! Haha; glad I’m not alone. However, this is by no means a recommended list, I’d recommend trying to take at least a third less than this! That’s what I’ll aim for next time! Yes that’s what I found too! Next time a good proportion of that list won’t be going with me! I agree the dry bags really help compress things and get more in! Next time I’m not taking much jewellery, I’ve only worn a couple of pairs of earrings! Packings always a challenge one way or another. I’m definitely going down the minimalistic route next time! Wow this is so detailed and helpful!! I just moved to another country for a year and packing was sooo hard!! And you did it in a backpack?! So so impressive! Definitely don’t use it as a guide on what to pack…it was way too much. Learn from my mistakes – haha!